None of my goats are for sale at this time. 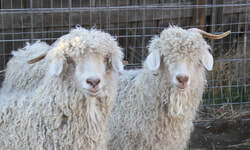 There is a lot of information available in books and on the web for information on the breed, care requirements, and properties of their fiber production, so I am just going to tell you my personal experience with Angora goats. They are pretty much all personality, and each one has their own way of relating to me. Some are all swagger, some are super shy and run away, but all of them will absolutely SWARM me when I am bringing them any kind of grain or other treat. So they are super easy to catch to give them their medicine and trim their hooves four times a year and shear them twice a year. They are remarkably healthy and disease-free.